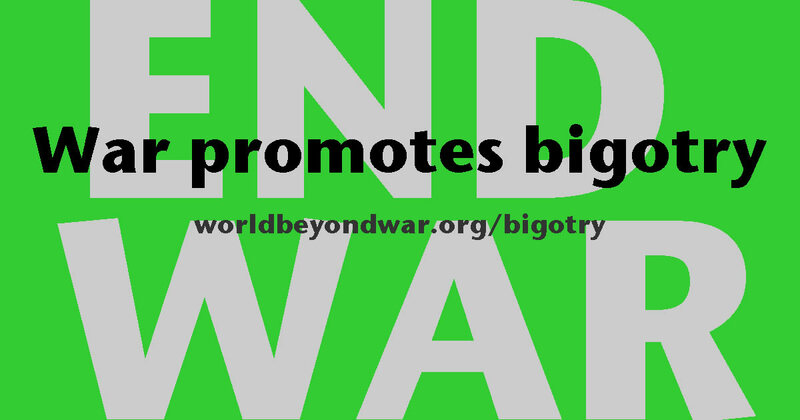 War Promotes Bigotry - World Beyond War . . .
War and war propaganda have often fueled and been fueled by racism, xenophobia, religious hatred, and other types of bigotry. Historian Kathleen Belew says there has always been a correlation in the United States between the aftermath of war and the rise of white supremacist violence. “If you look, for instance, at the surges in Ku Klux Klan membership, they align more consistently with the return of veterans from combat and the aftermath of war than they do with anti-immigration, populism, economic hardship, or any of the other factors that historians have typically used to explain them,” she says. Dr. Martin Luther King Jr. famously said that we would need to tackle three interlocking problems together: racism, militarism, and extreme materialism. What makes the most fantastic and undocumented lies credible are differences and prejudices, against others and in favor of our own. Without religious bigotry, racism, and patriotic jingoism, wars would be harder to sell. Religion has long been a justification for wars, which were fought for gods before they were fought for pharaohs, kings, and emperors. If Barbara Ehrenreich has it right in her book Blood Rites: Origins and History of the Passions of War, the earliest precursors to wars were battles against lions, leopards, and other ferocious predators of people.16 In fact, those predatory beasts may be the base material from which gods were invented—and un- manned drones named (e.g., “the Predator”). The “ultimate sacrifice” in war may be intimately connected with the practice of human sacrifice as it existed before wars, as we know them, came to be. The emotions (not the creeds or accomplishments, but some of the sensations) of religion and war may be so similar, if not identical, because the two practices have a common history and have never been far apart. Underhill means his own soul, and the Lord’s people are of course the white folks. The Native Americans may have been courageous and valiant, but they were not recognized as people in the full sense. Two and a half centuries later, many Americans had developed a far more enlightened outlook, and many had not. President William McKinley viewed Filipinos as in need of military occupation for their own good. As the war ground on for years, pointlessly destroying millions of lives, senators on the Foreign Relations Committee discussed in secret their concern that they had been lied to. Yet they chose to keep quiet, and records of some of those meetings were not made public until 2010.30 The flags had apparently been waving through all the intervening years. War is as good for patriotism as patriotism is for war. When World War I began, many socialists in Europe rallied to their various national flags and abandoned their struggle for the international working class.31 Still today, nothing drives American opposition to international structures of government like U.S. interest in war and insistence that U.S. soldiers never be subject to any authority other than Washington, D.C.